This story was updated Jan. 14, 2019, at 7:46 p.m. with more information. DETROIT — As Volkswagen speeds ahead with an electric vehicle plant in Chattanooga — investing $800 million and hiring 1,000 workers — growing its supplier base is seen as a key plus. Herbert Diess, Volkswagen's chief executive, said Monday there will be "many more suppliers" coming to service the new facility — Volkswagen's first electric vehicle manufacturing facility in North America — slated to go next to Chattanooga's existing production plant. Diess said at the North American International Auto Show that the United States is the second-largest market after China for electric vehicles, and the new production and technology is expected to lead to more growth in the Chattanooga automotive supplier base. "Volkswagen is 100 percent committed to the United States," he said about the company that employs about 3,500 people in Chattanooga. Scott Keogh, Volkswagen Group of America's chief executive, said plans are to make an electric vehicle, a crossover, in Chattanooga in 2022-23. "For more than a decade, Volkswagen has proven time and again that when they invest in Chattanooga, their company and our community succeed together." "This is another exciting day for Volkswagen and Hamilton County. We are also looking forward to the new suppliers that will invest in Hamilton County to support this Volkswagen expansion." "This is really launching 2019 out with a bang. We're elated because this is an employer we are all familiar with in our community. The exciting thing about this is that it is a continuing investment from a local company that believes in Hamilton County and they believe in our local workforce." "TVA and EPB are excited to congratulate Volkswagen on its decision to expand operations in Chattanooga Helping to facilitate job creation is fundamental to TVA's mission of service and we are privileged to partner with the Tennessee Department of Economic and Community Development, Chattanooga Area Chamber of Commerce, city of Chattanooga and Hamilton County to facilitate impactful new job creation by Volkswagen, one of our region's major employers." "Great news in the automotive sector as GM and VW choose to invest in Tennessee. I look forward to building on this momentum and keeping Tennessee as one of the best states to do business." "Today's announcement that Chattanooga has been selected as the North American hub of electric-vehicle manufacturing beginning in 2022 promises to be extremely beneficial with a multi-million dollar investment and the creation of new job opportunities. I look forward to this announcement coming to fruition and I thank Volkswagen for being a driving force in the success and prosperity of Hamilton County." "This will have a huge positive impact on citizens and businesses throughout our communities and will continue to strengthen our state's strong concentration in automobile manufacturing." "We are encouraged by today's product announcement and we look forward to the day when VW agrees to follow U.S. labor laws." "The first product will be an SUV," he said, citing the shift among auto buyers away from cars and more to crossovers and trucks. He said the details about the square footage of the expansion, a timeline and hiring will come later. When asked if other VW Group brands, such as Audi, could see electric vehicles built in Chattanooga, he said plans are for Volkswagen production at this time. Tennessee Gov. 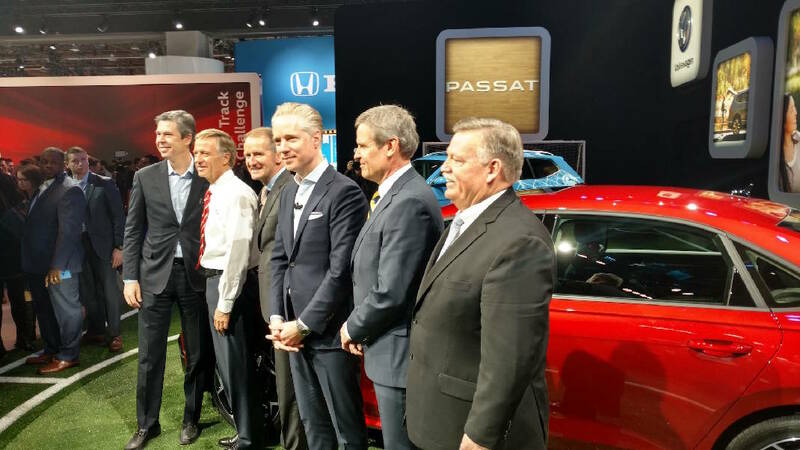 Bill Haslam, who was in Detroit with Gov.-elect Bill Lee, said he, too, sees opportunities to increase the supplier footprint due to VW's investment. "It's exciting for Chattanooga and Tennessee," said Haslam, who took off his suit coat to show a VW Chattanooga team member shirt. Lee said VW has partnered in work force training efforts in Chattanooga. He expects those initiatives to continue with the ramp-up of the electric vehicle plant, and he said that training is vital to employers across Tennessee. Chattanooga Mayor Andy Berke termed the VW announcement "a huge day" for the city. "We want to be at the forefront of the next generation of vehicles from Volkswagen," he said. "That's electric and that's SUVs." Hamilton County Mayor Jim Coppinger said the new facility is a boost to the supplier base, as well as to the public education system. "We are also looking forward to the new suppliers that will invest in Hamilton County to support this Volkswagen expansion," he said. State and local officials said there is an incentive package that was offered to VW. Bob Rolfe, the state's commissioner of economic and community development, said those details will be released later. Charles Wood, the Chattanooga Area Chamber of Commerce's vice president of economic development, said the automotive industry's future is moving toward electrification. "It will have a long-term impact on the industry," he said. "The supplier base is a big part of what happens." Volkswagen has committed to spending tens of billions of dollars worldwide over the next five years or so on e-mobility. It has developed a new modular platform that will underpin all its electric vehicles worldwide, dubbed MEB, and it will be part of the new investment in Chattanooga. Total U.S. electric vehicle sales came in at 361,307 for the year, up 81 percent over 2017, according to Inside EVs. However, battery car manufacturer Tesla was responsible for more than 50 percent of total plug-in vehicle sales last year, figures show, with the rest of the industry picking up the remainder. Sales by Volkswagen of electric vehicles amounted to about 1 percent. VW started auto production in Chattanooga in 2011, making the Passat sedan. In 2014, Volkswagen announced it would create 2,000 more jobs as it planned SUV production in Chattanooga in a $900 million expansion. State and local officials agreed then to provide VW with $260 million in incentives for the 2,000 additional jobs, or $130,000 per post. In 2018, Volkswagen said it would spend $340 million to build the five-seat Atlas.